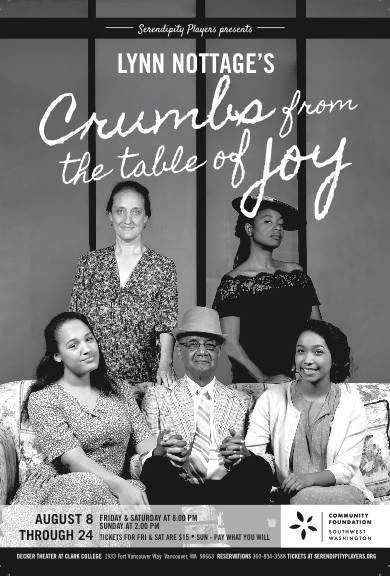 This play by Pulitzer-Prize winning author, Lynn Nottage, is playing at Clark College’s Decker Theatre, 1933 Fort Vancouver Way. It is directed by Tony Broom (Serendipity’s Artistic Director) and runs through August 24th. For more information go to their site at www.serendipityplayers.org or call 360-834-3588. If you could sum up this play in one sentence, it might be, on the way to her high school graduation…life happened. It is assumedly a reflection of the author’s teen years with her family during the early 1950’s in Brooklyn, NY. Her alter-ego, Ernestine (Elena Mack), is a senior in high school and preparing for graduation. She lives in her small apartment with her younger sister, Ermina (Kiara Gaulding) and her Dad, Godfrey (Phillip Bowles), a baker, a God-fearing man and a follower of Father Divine. Into their cramped lives appears their Aunt, Lily (Dee Harris), apparently planning on an extended stay. Her character is somewhat south of a high-classed call girl and extremely left (an avowed Communist, in fact) in her political views. This cramped, confined, Christian household is no atmosphere to raise two, budding girls, who are rudely being jolted into the seamier side of life. The code of the father is the three V’s, “Virtue, Victory & Virginity.” But, “ain’t necessarily so,” with Auntie. And, if this wasn’t enough to shake the proverbial apple tree, Godfrey meets a stranger on the street, Gerte (Kate Lacey) and promptly marries her. She is an immigrant from Germany and white, or a “cracker,” and the Crump family is black, or “colored,” as the times would testify to. And, keep in mind, this is 1950’s, just after WWII and the defeat of the German Nazis. So now, in one household, we have a staunch Christian; a revolutionary Communist, the beginnings of a black power movement; and a white immigrant from a county we just defeated in a war. What a way to enter the “real” world for young, impressionable girls. The story is not so much about the day-to-day routines of a family but of the cultural dynamics that the family is faced with because of the times. A little background might be in order here. Communism was an acceptable alternative to the 30’s depression in America. The famous Group Theatre had many members that had leftist leanings. And Paul Robeson, the great black actor/singer from that period, joined the Communist Party because he felt they had a more equable view of people of his Race. Also, it was the Nazis who were the bad guys during the War, not the German people. And religion was an important aspect of Black culture. So, a logjam in the Crump home. Dr. King was just beginning his campaign in the South against segregation; the young, Emmett Till, was beaten to death because he whistled at a white woman; the brave, Rosa Parks refused to give up her seat on a bus to a white woman; and Lorraine Hansberry had yet to write her great play about the explosive dynamics within a black family, Raison in the Sun. This was the turbulent, transitional time of this true tale. And it has power in its telling, as the lead character flips from monologues in the present, to express her views and desires at the time, to painful recollections of the past. And the characters are allowed to breathe on their own, neither presenting us with a totally dark or pure person but ones that are all shades of gray. Broom’s direction takes us easily from one time frame or place to another with simplicity in staging. And he has done a good job of leading the actors through the complicated series of feelings that the play presents. A good choice for a play, letting us examine the times before “…the changing,” the 60’s. Mack does very well in the demanding role of the storyteller. The frustrations, doubts and discoveries show plainly in the face of this shy, curious girl. I would recommend, though, at times, she should be aware of diction and volume, as a few of her lines tended to get lost because of this lack. Bowles, as the patriarch of the family, certainly has the enthusiasm that is appropriate for the role, but he is a bit stiff, at times, and seemed to have occasional trouble with lines, possibly opening-night jitters. Gaulding, as the youngest daughter, is wonderful. She has the right zest for the role, dealing with conflicting emotions and trying to find her own place in the world. She is pretty, lively and animated and one would hope to see more of her in the future. Harris, as the Auntie, gives us a conflicted woman, dealing with ghosts of the past and fighting “the good fight” in a world that is not ready for her. A woman, ahead of her time, who one feels sorry for and yet secretly likes. A lovely performance. And Lacey is quite a find. Her German accent seems spot on and her brief imitation of a Dietrich song is very good. Your heart goes out to her as she struggles with her new world. A haunting performance. I would recommend this play, especially for the history it imparts. If you do go, please tell them Dennis sent you. This musical, written by Carol Hall, Larry King and Peter Masterson, is playing at the Deb Fennell Auditorium at Tigard, High School, 9000 SW Durham Road. It is directed by Peggy Taphorn, choreography by Jacob Toth and musical direction by Eric Little. It will be performed through August 17th. For more information, go to their site at www.broadwayrose.org or call 503-620-5262. This so-so play was also made into a so-so film with Dolly Parton, Burt Reynolds and Charles Durning. Although the play has some good song & dance numbers, the script/characters are never really fully developed. You fall in love with Shy at the beginning, but then she just disappears into the background. Another interesting character, Doatsey, the waitress, has one wonderful song then she, too, fades in the sunset. In short, the story is like a beautiful yellow rose (of Texas) in its budding stage, which never blossoms. Mind you, this is not a criticism of the production, which is very good, but of a script that is under-developed. The talented troupe deserves a better script than this to let their talents shine. Their Music Man in July was amazing (see my review elsewhere on this site). The story is loosely based on true happenings. A chicken (because customers sometimes paid with fowl) or mustang ranch was a house of ill-repute. This one happens to be in Gilbert, Texas. Mona (Sharon Maroney) is the matriarch of the family of ladies. At the outset of the story, two newbies, Angel (Claire Rigsby) and Shy (Jennifer Davies) have arrived in town and are seeking employment with her. But Mona and her co-manager, Jewel (Carmen N. Brantley-Payne), need to outline the strict rules of the establishment, among them: no swearing, the men are considered guests, get the money up front, etc. This ranch is tolerated by the town because it is outside of the city limits and the town, being run by men…will you can guess the rest of the “logic” as to why it’s was allowed to survive. Also, Sheriff Earl (Colin Wood) is sweet on Mona, as they had a fling some years before. But with TV becoming the prominent media exposure now and this being election year, things are about to change. Also the big backers to the politicians are a group called, the Watchdog, a “Jesus bunch,” headed by Melvin P. Thrope (Dan Murphy), who wants the chicken ranch gone. So, the Governor (Jim Peerenboom) and Senator (Brian Tennison) need to persuade the town and its Sheriff to close Mona down. But their star football team, the Aggies, are frequent “guests” of the house after winning a big game. And even the diner’s waitress, Doatsey Mae (Emily Sahler), has dreams of one day becoming one of Mona’s girls. But, as the saying goes, you can’t fight City Hall, and so…but I won’t want to be a spoiler, you’ll have to see for yourselves as to what happens. Suffice to say, the ending is bittersweet. The main strength of this production lies in the chorus and their numbers, and the solos by some of the central characters. Maroney is very good in her main numbers, especially “A Little Ole Bitty Pissant Country Place,” and the heartfelt, beautifully sung, “The Bus From Amarillo.” Wood was effective in his solo with “Good Ole Girl,” and Murphy appropriately animated in his numbers. Also Peerenboom’s, “Sidestep,” was a standout. Unfortunately the spoken script left these talented actors with little more than stereotypic dialogue to rely on. Brantley-Payne wowed the audience with the scene-stealing number, “24 Hours of Lovin’” and Sahler lovingly sang her signature solo, “Doatsey Mae.” Both numbers were highlights of the show. But, again, these fine talents were under-used in the spoken part of the story. But Toth’s dance sequences were astounding and worth one’s attendance at the show! He had an amazing group of young men and women to work with as the chorus and it shows with the play’s most rousing scenes. Bravo, chorus! Taphorn is a very good director of musicals, as she assembled an amazing cast for this production. She keeps the play/scenes moving at a quick pace and her staging works well. The scenery, especially the interior of the house (Sean O’Skea), terrific costumes (Shana Targosz) and those eccentric wigs (Dana Rosendahl) added spice to the show. And Little had a great band (Justin Jude Carroll, band leader) who did not overpower the singers, which often happens in musicals. I would recommend the show, mainly because of the musical numbers and the talent of the whole cast. But keep in mind the subject matter when it comes to the young. This story makes light of a rather delicate and serious matter when it comes to families and relationships, so be advised. It is interesting to note that the script does not depict the wives of the men in this story, as they might have a much harsher view of this subject. If you do choose to see it, please tell them Dennis sent you. This was made into a rather good film starring Gary Oldman, Tim Roth and Richard Dreyfess. It follows two minor characters of Hamlet and lets us see the world through the eyes of the “little people” of a set period and time. It is a microcosm of our larger universe where, as hypothesized here, everyone has their place and plays their part until the end. But what if two entities question that state of being and attempt to rebel? What if they choose not to play their parts and go a different direction entirely? Since they are to die (as the Hamlet plot suggests) or, perhaps, are already dead, and simply replaying their actions that lead to it until they accept that fact. R&G are onstage the entire play and their only contact with any sort of reality, are the Players/Actors from the story. Rosencrantz (Joel Patrick Durham), definitely not the sharpest knife in the drawer and Guildenstern (Caitlin Fisher-Draeger), the brighter of the two, are left to ponder their existence when not actively engaged in the Hamlet story. They have little or no memories of past history or relationships, seemingly tied together because their deaths are. Then they meet the Players (Alwynn Accuardi, Gretchen Vietmeir, Murri Lazaroff-Babin and Kristen Lang) and their leader (Paul Susi) in their alternate universe. R&G seem to think that death is not unlike a stage death of one of the actors. That it is done for dramatic effect, then they rise again and go about their normal lives. How one comes about their end is fated and one should simply accept it. But R&G seem to feel that there should be an element of suspense, of probability, of chance, in living life. That they should have choices and if one takes another path, results will be different. The actors, of course, have this option, as they can play material already written down, or improvise and outcomes will be different. “Actors are the opposite of people,” as the Player Leader says. Actors play their parts in stories set down for them. Ordinary people, it seems, haven’t caught onto this concept yet. What comes after death, if anything, is never fully explored, but it seems that acceptance of one’s death is the key, before one can move on. R&G seem caught up in this rotating pattern, never coming to grips with the reality of their situation. Stoppard’s play intersperses with Shakespeare’s story at times and the same cast is used for both plays. One seeming goof is that in this company’s version of Hamlet, The title character is referred to as Lady Hamlet, because she is played by a female actor, and in Stoppard’s take, they refer to the character as he. The reason being is that Stoppard’s play is copywritten, so not able to change the text, and the Bard’s is not. As expounded by the end, was there a time when they could have made different choices and, thus, their outcomes would have been different. That question hangs in the air…no ready answer in sight. And, as the darkness settles over them, will there be a new dawn, or will they again repeat their actions until they get it right, like in Groundhog Day? This type of existentialism has been examined in plays before by many other authors including Tennessee Williams’ Out Cry, Jean Cocteau’s The Infernal Machine, Pirandello’s, Six Characters in Search of an Author, et. al. Gregory keeps the play moving at a rapid pace and the crucial element, timing, is spot on. It is recommended to see both plays in order to see how they connect. Both Durham and Fisher-Drager (co-Artistic Director of Anon…) are super. The lines are very difficult to learn (as I can attest to, having played Rosencrantz myself in a production back East) as these two characters have about 75% of the line load and many of the lines appear not to make sense. But both of these actors are up to the challenge and hold your interest throughout. The same can be said for Susi and his troupe of players. He has the power to be a convincing classical actor and yet can be conversational when needed. He is very effective. And, his group of players, all have distinctive personalities, which adds to the dark humor of the presentation. Again, as my review of Hamlet indicated, Lang, in a small role, is very watchable. She has an intense focus of her character and the story which highlights her talent. I look to see her in larger roles in the future. This dark comedy by Christopher Durang is playing at Twilight’s space at 7508 N. Hereford Ave. (off Lombard) in North Portland. It is directed by J.J. Harris (Twilight’s Artistic Director) and runs through August 10th. Check out their site at www.TwilightTheaterCompany.org or call 503-847-9838. “Someone To Watch Over Me” could well be described as the theme song for this show, as it has a dual meaning. Not only is it a character’s personal favorite song but it is also, in a way, part of a motto, perhaps, of therapists’ duties in watching over people’s psyches. Of course, in the absurdist’s world of Durang, anything is possible and everything probable or problematic. Most of the play takes place in a restaurant or a therapist’s office, so it is very contained in action and movement, which is fine, because Durang is a terrific wordsmith. Prudence (Paige McKinney), an uptight businesswoman and Bruce (Tom Witherspoon), a sensitive bi-sexual man, meet on a blind date. It seems, at the outset that they have little in common, except the above mentioned song. He cries at the drop of a hat and seems over-willing to please. And she is distrustful of relationships in general and seems to lack passion. On a couple of occasions the play Equis is mentioned, in which a therapist envies a young boy who lives with passion, a trait he does not share, forced to conform to society’s rules. An easy comparison could be made to the characters in this play. They, also, both go to a therapist. He to Charlotte (Rutheanne Kendrick), an eccentric, who has a small stuffed dog (Snoopy) for a confidant, is forgetful and has a bad case of malapropism (from a character in Sheridan’s, The Rivals) in which she misuses words to comedic ends. She goes to Stuart (Breon McMullin), a former boyfriend, whose main purpose, it seems, in having sessions with her, is to rekindle their relationship. But Bruce is also a bit remiss in explaining fully his relationship with Bob (David Hudkins), his live-in lover, who has a mother-fixation and a jealous streak, understandably, when Bruce brings Prudence home for dinner. It all comes to a head when all the parties meet at a restaurant and their waiter, Andrew (Adrian Woods), gets in on the act, as he gives Bob the eye. Can’t tell you anymore without ruining the story, but the real gems are in the dialogues between the characters and their deliveries. Harris has done a great job of casting people that are adept at this and timing, and it shows in their performances. He also uses the minimal space well by concentrating on the dialogue and relationships to hold your interest, rather than excessive movement. Witherspoon does well playing a conflicted man, longing for a relationship and genuinely loving both Bob and Prudence. And Hudkins, as one of his loves, is great at, not only his delivery of lines, but especially in his reactions and expressions, letting us in on his feelings in given situations, which is part of the essence of acting itself. Also, important to note, that these characters are not played stereotypically as Gays. They are played as human beings and that’s the way it should be! Bravo! McKinney is wonderful as the lead female. She is very natural as an actor and so her character becomes very believable. And Kendrick as the misspoken, misunderstood and malapropos therapist is funny as hell. You look forward to seeing her reappear onstage just to see how she’ll mess-up our language again. They are both joys to watch. Some warnings, though, as this small space does not have any air-conditioning and can get a bit stuffy inside, so come prepared in your dress. They do sell refreshments, which helps. Also a gun is fired at different times in the play so be warned. And, most of all, it is R rated because of language and adult situations, so consider that if you choose to see this show. It would be wise if the program and/or an announcement is made regarding these last two issues. It only plays through this coming weekend, so best get your tickets now, as there is limited seating. I recommend this play. If you do see it, please tell them Dennis sent you.